Background: Recently, it was demonstrated in a series of experiments that a specifically designed odor inhaler outperformed well-known and popular stress relieving techniques. In another study it was shown that odor inhalers increased attention and concentration in a demanding cognitive task. Objective: This paper follows up on these experiments and investigates whether such effects can also be found for an inhaler specially designed to reduce pain. Method: Two prospective randomized, controlled cross-over documentary studies were conducted comparing participants’ individual pain management (menstrual pain and chronic lower back pain) with an odor inhaler used as an adjuvant. Results: The odor inhaler improved pain dynamics like onset of pain and pain duration for both menstrual pain and lower back pain in a natural setting. In individuals suffering from chronic lower back pain, the inhaler also increased the pain alleviating effect of the individual pain management method. In both studies mood and well-being were considerably increased when the inhaler was applied. No side effects were reported. 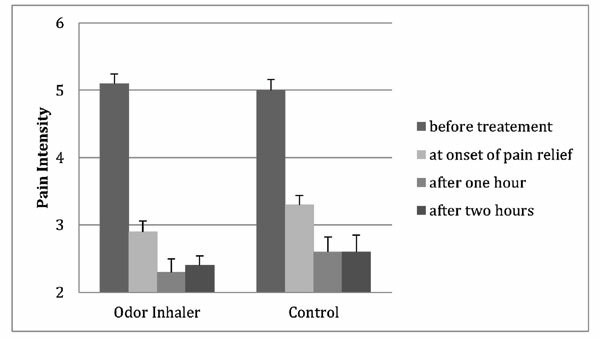 Conclusions: Even highly effective individual pain-relieving methods benefit from the use of this odor inhaler by changing pain dynamics and improving pain relief. Therefore, it helps to facilitate and amplify pain management. Aromatherapy, AromaStick®, chronic pain, essential oil inhaler, pain management, wellbeing.